Visit any U.S. Perfumania store location and enjoy shopping during BOGO Sale. 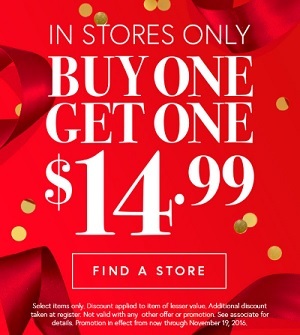 Buy one, get the second one for $14.99. Valid on selected fragrances. Plus, Perfumania Perks: sign up in-store and get an extra 10% discount on your entire purchase! Source of the information is U.S. Perfumania. The offer is valid until November 19, 2016. For more details about the offer visit any U.S. Perfumania store location.